Hewlett Packard - 446079-B21 446079-B21 HP Intel Xeon E5430 Quad-Core 2.66GHz 12MB L2 Cache 1333MHz FSB Socket LGA771-Pin 45nm 80watts Processor Kit For Proliant Dl160 G5 Server. New Bulk Pack. Hewlett Packard - 462781-001 462781-001 HP Intel Xeon E5430 Quad-Core 2.66GHz 12MB L2 Cache 1333MHz FSB 80w 771-Pin LGA Socket 45NM Processor. New Bulk Pack. IBM - 44R5633 44R5633 IBM Intel Xeon E5430 Quad-Core 2.66GHz 12MB L2 Cache 1333MHz FSB Socket LGA771 45NM 80W Processor For IBM System X3650 Server. New Bulk Pack. Hewlett Packard - 458259-L21 458259-L21 HP Intel Xeon E5430 Quad Core 2.66ghz 12mb L2 Cache 1333mhz Fsb 80w 771pin Lga Socket 45nm Processor. New Bulk Pack. Hewlett Packard - 458259-B21 458259-B21 HP Intel Xeon E5430 Quad-Core 2.66GHz 12MB L2 Cache 1333MHz FSB Socket LGA 771 80W 45NM Processor Kit For PROLIANT ML350 G5 Server. New Bulk Pack. IBM - 43W4003 43W4003 IBM Intel Xeon Quad-Core E5430 2.66ghz 12mb L2 Cache 1333mhz Fsb 771-Pin Lga Socket 45nm Processor. New Bulk Pack. IBM - 43W3987 43W3987 IBM - Intel Xeon E5430 Quad-Core 2.66ghz 12mb L2 Cache 1333mhz Fsb Socket J Lga771 45nm 64-Bit 80w Processor. New Bulk Pack. Hewlett Packard - GX572AA GX572AA HP Intel Xeon E5430 Quad-Core 2.66GHz 12MB L2 Cache 1333MHz FSB Socket LGA 771 45NM 80W Processor For Workstations XW6600 XW8600. New Bulk Pack. IBM - 44R5647 44R5647 IBM Intel Xeon Quad Core E5430 2.66GHz 12MB L2 Cache 1333MHz FSB Socket LGA 771 45NM 80W Processor. New Bulk Pack. Hewlett Packard - 455423-L21 455423-L21 HP Intel Xeon E5430 Quad Core 2.66GHz 12MB L2 Cache 1333MHz FSB 771-Pin Socket 45NM Processor For Proliant Ml150 G5 Server. New Bulk Pack. Hewlett Packard - 466656-B21 466656-B21 HP Intel Xeon E5430 Quad-Core 2.66GHz 12MB L2 Cache 1333MHz FSB 80w 771-Pin LGA Socket 45nm Processor Kit For Proliant Bl220c G5 Servers. New Bulk Pack. Hewlett Packard - 459504-L21 459504-L21 HP Intel Xeon E5430 Quad-Core 2.66GHz 12MB L2 Cache 1333MHz FSB Socket Lga771 80w 45nm Processor Only For Proliant Bl480C G1 Servers. New Bulk Pack. Hewlett Packard - 464887-B21 464887-B21 HP Intel Xeon E5430 Quad-Core 2.66GHz 12MB L2 Cache 1333MHz FSB Socket LGA771 80W 45NM Processor For Proliant Bl260c G5 Servers. New Bulk Pack. Hewlett Packard - 455423-B21 455423-B21 HP Intel Xeon E5430 Quad-Core 2.66GHz 12MB L2 Cache 1333MHz FSB 771-Pin LGA Socket 45nm Processor For Proliant Ml150 G5 Server. New Bulk Pack. Hewlett Packard - 457877-001 HP/COMPAQ - INTEL XEON E5430 QUAD-CORE 2.66GHZ 12MB L2 CACHE 1333MHZ FSB 771-PIN LGA SOCKET 80WATTS 45NM PROCESSOR (457877-001). NEW BULK. IN STOCK. READY TO SHIP SAME DAY. Hewlett Packard - 458575-B21 HP/COMPAQ - INTEL XEON E5430 QUAD-CORE 2.66GHZ 12MB L2 CACHE 1333MHZ FSB 80W 771-PIN LGA SOCKET 45NM PROCESSOR KIT FOR PROLIANT DL380 G5 SERVER (458575-B21). NEW BULK. IN STOCK. SHIP SAME DAY. IBM - 44E5077 IBM - INTEL XEON QUAD-CORE E5430 2.66GHZ 12MB L2 CACHE 1333MHZ FSB SOCKET-J(LGA771) 45NM 80W PROCESSOR ONLY (44E5077). NEW BULK. IN STOCK. SHIP SAME DAY. IBM - 43W3994 IBM - INTEL XEON QUAD-CORE E5430 2.66GHZ 12MB L2 CACHE 1333MHZ FSB SOCKET-J(LGA771) 45NM 80W PROCESSOR ONLY (43W3994). NEW BULK. IN STOCK. SHIP SAME DAY. Hewlett Packard - 457935-B21 HP/COMPAQ - INTEL XEON E5430 QUAD-CORE 2.66GHZ 12MB L2 CACHE 1333MHZ FSB SOCKET LGA-771 80W 45NM PROCESSOR KIT FOR PROLIANT DL360 G5 SERVER (457935-B21). NEW BULK. IN STOCK. SHIP SAME DAY. Hewlett Packard - 458259-B21 HP/COMPAQ - INTEL XEON E5430 QUAD-CORE 2.66GHZ 12MB L2 CACHE 1333MHZ FSB SOCKET LGA-771 80WATTS 45NM PROCESSOR FOR PROLIANT ML350 G5 SERVER (458259-B21). NEW BULK. IN STOCK. SHIP SAME DAY. Hewlett Packard - 446079-B21 HP/COMPAQ - INTEL XEON E5430 QUAD-CORE 2.66GHZ 12MB L2 CACHE 1333MHZ FSB SOCKET LGA771-PIN 45NM 80WATTS PROCESSOR KIT FOR PROLIANT DL160 G5 SERVER (446079-B21). NEW BULK. IN STOCK. SHIP SAME DAY. Hewlett Packard - GW499AV GW499AV HP Intel Xeon E5430 Quad-Core 2.66GHz 12MB L2 Cache 1333MHz FSB Socket LGA771 80w 45nm Processor For X6400 1st Processor. New Bulk Pack. 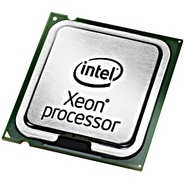 Hewlett Packard - GW500AV GW500AV HP Intel Xeon E5430 Quad Core 2.66GHz 12MB L2 Cache 1333MHz FSB Socket LGA771 80w 45nm Processor For X6400 2nd Processor. New Bulk Pack.